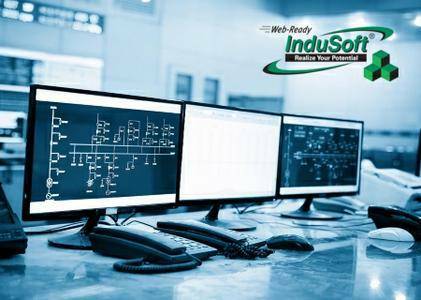 InduSoft, a leading-edge HMI software technology provider, has released update of Web Studio 8.0 is a powerful collection of automation tools that provide all the automation building blocks to develop HMIs, SCADA systems and embedded instrumentation solutions. InduSoft Web Studio v8.0 adds a new runtime, called IoTView®, compatible with operating systems Linux and VxWorks. Allied to the current runtime editions, such as InduSoft Web Studio, EmbeddedView, and CEView—IoTView provides even more scalability to design solutions with InduSoft Web Studio for deployment on any platform. As the number of Internet-connected devices in the world increases, InduSoft Web Studio is ready to connect these devices with the portability and small footprint to deploy on any platform, and the same user-friendly development environment. The InduSoft Web Studio 8.0 release is a natural evolution of the product’s life-cycle. With an agile method of development, InduSoft has released minor enhancements on a continuous basis, and v8.0 is the consolidation of all minor/major enhancements since the release of the previous version 7.0. This is the starting point for upcoming enhancements. 13941 Issue Resolved issue when using the Import Wizard to import XML Screen Files, and selecting multiple files, not all the screens were being created. 13838 Issue Modified the way dialog windows are handled when they are being called from scripts that are closing screens. 13750 Issue Resolves an issue when using Store and Forward and it is not deleting rows from secondary database. 13719 Issue Resolves a problem when using font that has spaces in it name. 13579 Issue Modified the Virtual Keyboard configuration files (VKFR.ini, VKJP.ini and VKCN.ini) to make sure that the SPACE key from the Virtual Keyboard (Alphanumeric) works properly in any language. 13493 Issue Resolved issue with the Grid Object not using the specified column width when opening the screen for the first time, when the Data Type was Set to Class Tag, the Labels were configured but the Members were not. 13378 Issue Resolved issue with the Tag Integration with RSLogix5000 feature where Tags configured on the L5K file as Alias, having a description that included parenthesis, would not work properly when browsing for tags using the Object Finder window. 13258 Issue Resolved issue where the Object Properties window would open empty for Linked Symbols the first time that a screen was open having the Collaboration Tool enabled. 13089 Issue Modified SMA Thin Client to make sure that the Linked pictures are properly displayed even when the dynamic path included backslash characters. 12874 Issue Resolved issue that was causing errors while loading Batch files on the Trend Control object. 12849 Issue Resolved issue with the TCP/IP Client Tasks not working properly if the password from the user configured for the authentication contains upper case letters. 12821 Issue Resolved issue with Thin Client (Web and Secure Viewer) not being able to write to Server Tags in case of the the connection with the Server being lost and then re-stablished. 12646 Issue Resolved issue with the Security System in Distributed Client Mode not connecting to the Distributed Server if this client was using the Data Protection feature. 12586 Issue Resolved issue that the "Support Information" window was not displaying license information when the protection mode used WiBu hardkeys. 12529 Issue Resolved issue with the Startup tasks not working properly when the product localization was set to a language other than English and the computer tried to start up the runtime upon is system restart. 12393 Issue Fixed IoTView memory issue that would cause bus error on some Linux devices when the program is executed multiple times. 13714 Change Request Modify the Mobile Access to have the same behavior as the Secure Viewer when displaying float point variables. 13236 Change Request Removed invalid Target System options "Local Interface Lite" and "Standard Lite" from the development environment (Project > Target System). 13168 Change Request Modified the way the "Retentive Values" option works on Embedded Runtimes. 12928 Change Request Modify Mobile Access to support a data input window for input objects. Modify Mobile Access to validate the data input based in both the tag type and the parameters passed through the KeyPad function. Modify Mobile Access to open the native virtual keyboard when it is enabled in the operational system. 11763 Change Request Resolved Localization issues with the recently implemented dialog windows. 13612 Requirement Implemented a new capability to programmatically define which tags will be pre-loaded by the Run-Time. 12935 Requirement Implemented a new Tag Integration solution for the Siemens TIA Portal, which supports Siemens S7-1500 PLCs.